Interior and exterior doors, as you already know, are a key element to a home. While most people often think of the door when they envision one, many often forget about the frame, which is essential for the overall security and integrity of the door. As with most pieces within the home, the door frame, over time, will not be immune to damage as a poor door frame may begin to stick, swell, rot or even sag as time goes on. How much does it cost to replace a door frame? The costs to repair a door frame will really depend on the size of the door, the type of door frame and its location. For most straightforward interior door frame repairs or replacement, be prepared to spend about $100 to $350, whereas an exterior door frame, depending on the size, can cost upwards of $400 to $650. This estimate, with most contractors, should include the door frame materials, the labor required and the other materials which are needed for the project such as the shims, caulking and/or the insulation. This will be the estimate for the door frame only, not the actual door if this needs to be replaced as well. While most jobs are fairly straightforward, it doesn’t hurt to receive multiple quotes from local contractors. We recommend HomeAdvisor.com if you want to receive multiple quotes all in one place. Here, you simply describe your job and the licensed, screened contractors in your area will contact you with a quote for your job for free. On Angie’s List, a few professionals chimed in, answering this very question, and said it will be cheaper to purchase a new door that already fits in the existing frame, even if it was causing problems and/or was rotted. The reasoning behind this is due to the fact that the labor time will be about the same as compared to fixing the frame versus installing a new door. As each carpenter will have its own local rate, if you were to want to go ahead and fix the door frame, it could be hard to pinpoint a price, but they mentioned you should estimate four to six hours or a half of day worth of labor and multiply it by the hourly rate. With this information, see if it makes sense to purchase a new door rather than replace the frame and use the existing door. Drafts – Frames which are unevenly installed can cause a draft, which allows the air to flow freely into the home. 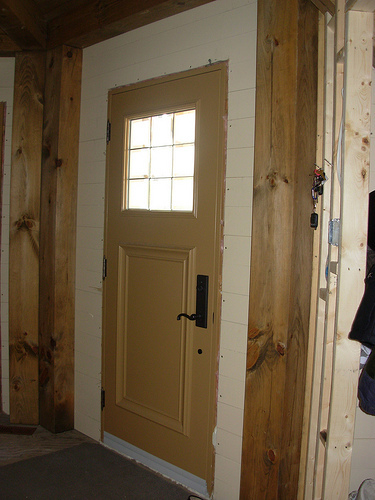 For an exterior door, this can greatly increase the utility bills during the winter. To fix this issue, a contractor will either replace the entire frame and/or door or as a cheaper alternative, homeowners can install weatherstripping to block any drafts. Sticky door frame – As the humidity and/or temperature fluctuates inside the home, the door frame and/or door may now cause difficulties when using the door. For a sticky door, a contractor will often sand the door frame and the edges of the door to allow the door to shut freely again. Split door jamb – A broken door jamb, often the result of some sort of force, will no longer allow the door to properly latch shut. With a split door jamb, the pieces will be removed and reglued back together and re-installed back in its place by using glue and a body filler. Sagging issues – From a distance, if it looks as if the door is sagging, this is often due to the door frame and will interfere with the door as it swings open and shut. To resolve this problem, a contractor will sand the upper part of the door as a temporary fix or the upper hinge will be repaired and/or replaced. All door frames are not created equally as an interior door frame will be constructed differently when compared to an exterior one. For instance, an exterior door will often measure 36 inches wide, while an interior door will measure about 30 inches wide. Also, since an interior door isn’t exposed to the outdoor elements, it will not require a heavy-duty frame nor will it require as much security. Your exterior doors will need to be made of a heavier, weather-resistant material to create a sturdy frame which is protected against any force and/or harsh weather. Composite – These door frames offer the same look as wood, but being a composite material, it will not crack or splinter. Metal – Steel and/or aluminum are commonly found in a corporate office-like setting and are rarely found in a residential setting. Wood – This is the most common door frame found in almost all residential homes. Whether stained or painted, this classic, yet basic look will have two two door jambs, a crosspiece near the top and a sill at the bottom.